Watch a video clip about Adolph Hitler and the rise of the Nazis. Listen to Hitler addressing his army and special forces (the SA and the SS) in 1933. Find out about the day Hitler became Chancellor of Germany in 1933. Newsreel footage of a huge rally of hundreds of thousands of boys and girls singing and giving the Nazi salute in 1933. Another huge youth rally in 1938. Newsreel video of Germany's invasion of Poland in 1939. Photos and video clips of Adolf Hitler. Watch a video about the Nazis' most notorious concentration camp, Auschwitz. An informative account of the life of Adolf Hitler, from his childhood in rural Austria to becoming the dictator who led Germany into a bloody world war and murdered over six million Jews in the Holocaust. Part of the Usborne Young Reading series, this book features facts, photographs and links to websites with archive newsreels of historical events. 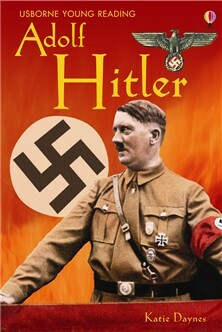 I think the book Adolf Hitler is a very good book ideal for all young readers. In conclusion it's a great book with detail.